Ukrainian journalist Rostyslav Shaposhnikov, who lives in Florida, posted on his Facebook page a photo that caused a huge outcry and even provoked a negative reaction from the Ukrainian authorities. The photo depicted common chicken eggs from an American supermarket. 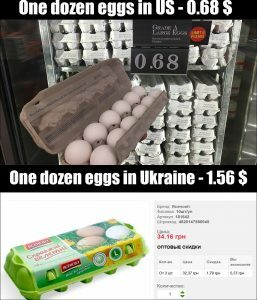 Such a banal product attracted the attention of Rostyslav with its price – 12 eggs were sold for $ 0.68 (18 uah), while in Ukraine 12 chicken eggs cost $ 1.56 (41 uah). 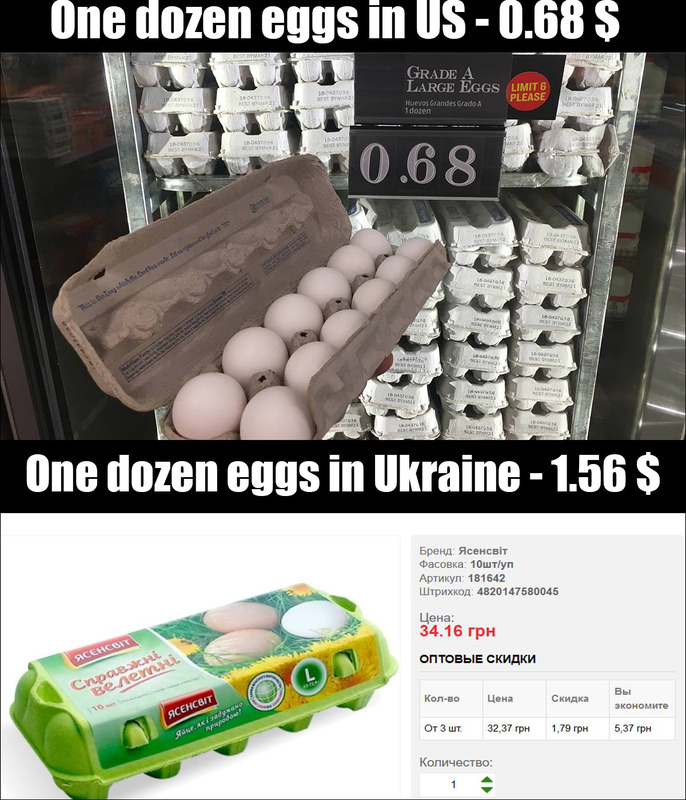 “A question to the most successful Prime Minister Vladimir Groisman: Why do in the USA 12 hen eggs cost 18 UAH, and in Ukraine the same 12 hen eggs cost 41 UAH [$ 1,54]? The average salary in the US is [$ 3,770] which is 100,000 UAH / month. The average salary in Ukraine is [$ 283] 7500 UAH / month”. This record has collected more than ten thousand reposts. 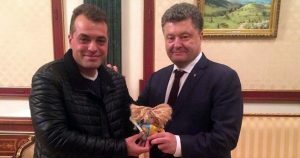 In the comments, adherents of the Ukrainian authorities called the photo fake and photomontage, and advisor of the President Petro Poroshenko Yuri Biryukov even called Shaposhnikov a communist. To prove the reality of the photo, Rostyslav had to return to the Aldi supermarket and take video evidence, where not only the price of Grade A Large Eggs, but the entire purchase process was filmed, a check was shown to avoid further preposterous charge. But the “porohobots” as Rostyslav calls the commentators, were not satisfied with the evidence, and again the comments followed that the eggs at such a price, unambiguously are expired and rotten. Rostyslav had to shoot another video to exonerate himself. The second video captured the expiration date – until March 21 of this year. And also Shaposhnikov on this video fries bought chicken eggs, which look absolutely fresh. “The cashier in this store gets $ 10 per hour, hence for 1 hour of work he/she can buy 176 eggs. Even if the eggs cost $ 2, an American cashier will buy 60 eggs for 1 hour of work. In Ukraine, the cashier in Kiev receives [$ 1,13] 30 UAH per hour, hence for an hour of work he can only buy 10 eggs. 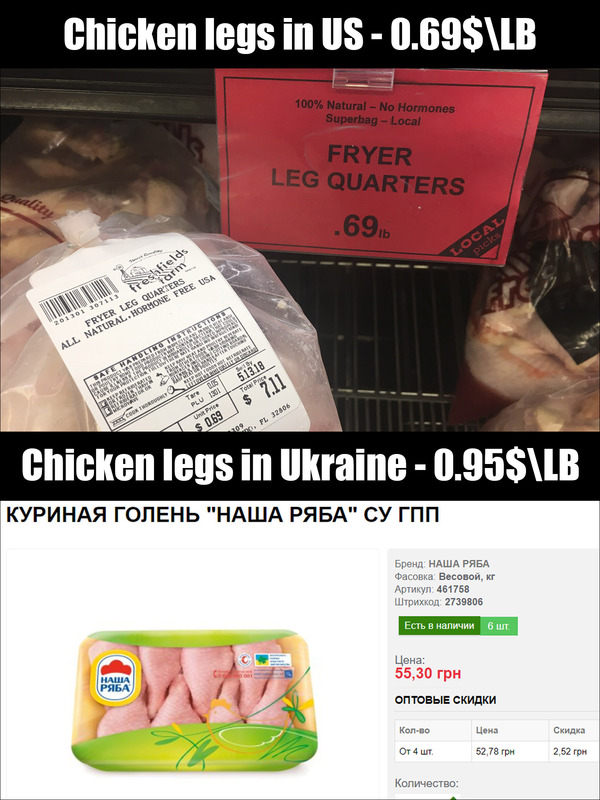 The question is – American and Ukrainian cashiers do one job, they sell the same product. Who steals salaries of Ukrainian cashiers?”. 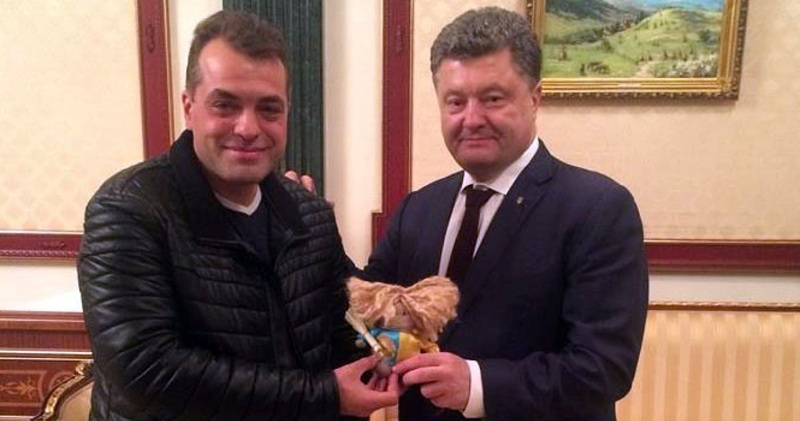 Shaposhnikov called Ukrainian entrepreneurs and the entire state as a whole a “corrupt grid”. 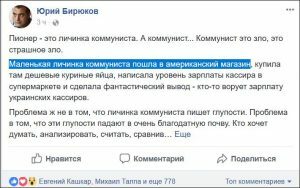 The guy also wondered why the malicious commentators, instead of raising the issue of the correlation of prices and salaries in Ukraine, start to attack Shaposhnikov for the information he provided. 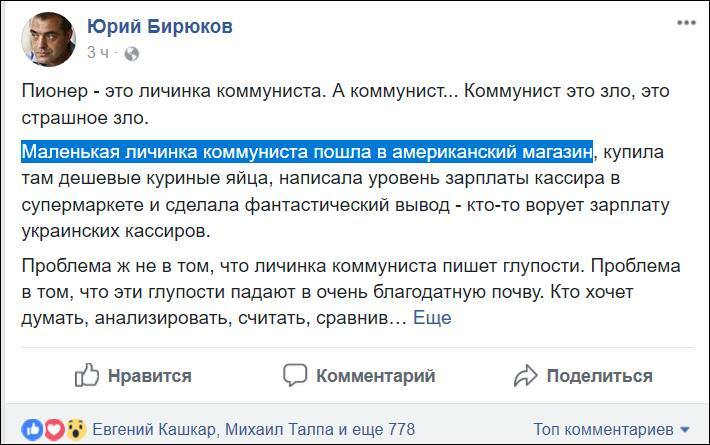 “A small communist larva went to an American store, bought cheap chicken eggs there, wrote a cashier’s salary in a supermarket and made a fantastic conclusion – someone steals the salaries of Ukrainian cashiers”. “The question is that the communist larvae do not offer real solutions to problems, it’s not in their plans. The communist larvae talk about the need to arrest oligarchs, but do not say how to do it”. Rostyslav Shaposhnikov is perplexed – as an ordinary photo of the counter could cause thousands of insults and humiliations of him as an individual in his address. But all this, Rostyslav adds, only shows the intellectual level of his opponents in the discussion. 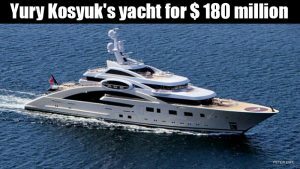 After such words of Biryukov, Shaposhnikov decided to present more serious arguments, namely, a photo of Yury Kosyuk’s yacht, owner of the company Nasha Ryaba, the cost of which amount $ 180 million. 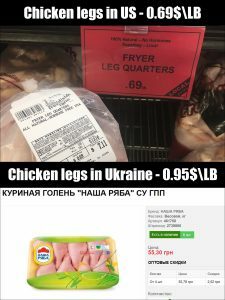 According to Rostyslav, Kosyuk sells chicken at American prices, but the salary of employees he prefers to pay Ukrainian ones. In the United States, such a situation is simply impossible – for a billionaire entrepreneur to sell his products at inflated prices, while paying a beggarly salary to employees. Recently, an article appeared that Yuri Kosyuk received regular state subsidies in the amount of 1.4 billion hryvnia, which, by the way, amounts to as much as 30% of all subsidies that the state allocated to the agro-industrial complex for the year. Based on this information, it is easy to draw logical conclusions about the fact that the director of Nasha Ryaba and the Ukrainian government are in collusion. Under the post of Yuri Biryukov, the presidential adviser also noted that the American cashier needs to pay taxes from his big salary, after which the remaining amount will not be much different from the Ukrainian salaries. Even by omitting the fact that Ukrainians are also not exempt from taxation, it is worth noting that the minimum wage in the US is $ 1,400 (38,000 hryvnia), and in America there is a progressive tax rate. That is, those who earn little, almost do not pay taxes. The amount of taxes in the States directly depends on the income of the employee, the number of members of his family (the presence of children implies even a tax refund) and on a variety of different factors. 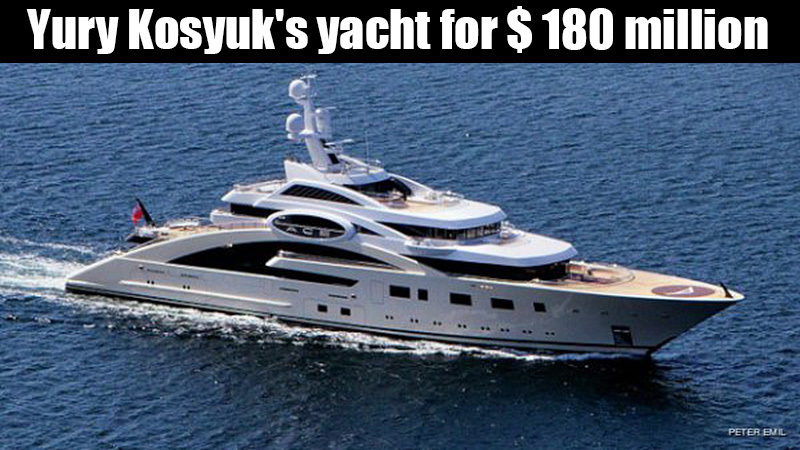 Yuri Kosyuk in the United States would pay hundreds of thousands of dollars in tax. 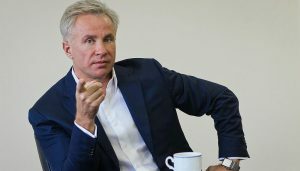 Summarizing all the above mentioned information, Rostyslav Shaposhnikov is interested in the opinion of users that in Ukraine people who produce chicken and eggs are billionaires, and potential buyers of these same eggs are practically beggars. This ending of Shaposhnikov’s video appeal suggests that the “egg” discussion is likely to have a hot continuation.